While Syed A Shah Geelani was seen as a “hardliner”, Mirwaiz, Shabir Shah, Abdul Ghani Bhat and Bilal Lone had “moderate” views for which they faced threats from the militants, said a senior government official. 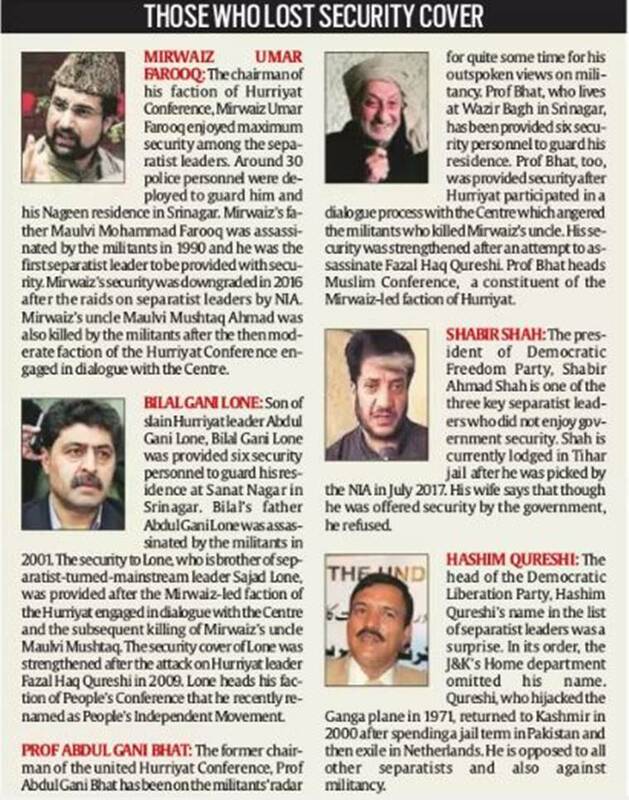 The separatist leaders whose security cover was withdrawn on Sunday by the Jammu and Kashmir government were provided security because they faced threat for being pro-dialogue, officials said. The killing of Mirwaiz Umar Farooq’s father, Maulvi Mohammad Farooq, by militants in the 1990s for supporting dialogue initiated the need for a security review of these leaders, the officials said. While Syed A Shah Geelani was seen as a “hardliner”, Mirwaiz, Shabir Shah, Abdul Ghani Bhat and Bilal Lone had “moderate” views for which they faced threats from the militants, said a senior government official. They were given security by the state government and the expenditure was also borne by the state government, he added. Geelani does not enjoy security and is under house arrest. The separatist leaders’ security cover was withdrawn in wake of the Pulwama attack which left 40 CRPF personnel dead. Explaining the role of the separatist leaders whose security cover was withdrawn, a senior official said the All Parties Hurriyat Conference was formed on July 31, 1993, as a political platform of the separatist movement. The Hurriyat later split on questions of its future strategies, role of militancy in the separatist movement and dialogue. The Geelani-led group was firm that talks with New Delhi could take place only after the Centre accepted that Kashmir was in dispute, while the group led by Mirwaiz was ready for talks. The Mirwaiz group also entered into a direct dialogue with New Delhi during Prime Minister Atal Bihari Vajpayee’s tenure and held talks with the then Deputy PM L K Advani in 2004. Last year, former chief minister Mehbooba Mufti, while responding to a cut motion moved by Independent MLA Pawan Gupta in the Assembly, shared details of funds spent on the security of 14 Hurriyat leaders from 2008 to 2017. Mufti informed the Assembly that the state had spent around Rs 11 crore on security and transportation of separatist leaders in the past 10 years. Officials at the Union Home Ministry told The Indian Express that besides separatists, security has been granted to several political activists and leaders from Jammu and Kashmir based on threat perception. The Omar Abdullah-led government in 2015 had informed the Assembly that over Rs 506.75 crore were spent on the security cover for 1,472 political activists, including separatist leaders, since 2010.